A thorough check turned up no sign of the big cat. 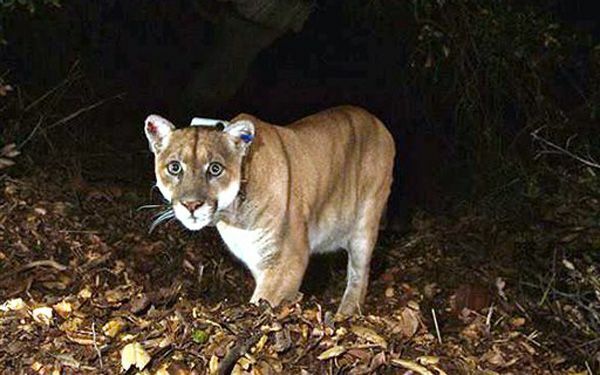 It is known as P-22 and was found under a residence in the hilly Los Feliz neighborhood. That's near Los Angeles. This was according to Lt. J.C. Healy of the California Department of Fish and Wildlife. Homeowner Rachel Archinaco told television station KABC that workers were installing a home security system. They encountered the cougar in a crawl space. 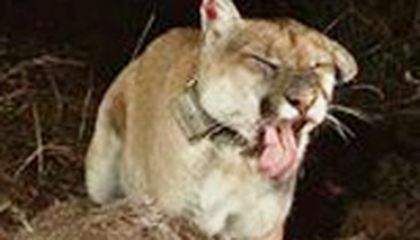 The wild mountain lion, which has a red ear tag, normally lives in Griffith Park. It is right next to the neighborhood featuring hillsides covered in thick brush. The animal arrived in the area several years ago from the western slopes of the Santa Monica Mountains. It crossed two freeways to get there. National Geographic famously photographed P-22 in 2013 with the Hollywood sign in the background. Several sharp photographs from a remote camera in Griffith Park captured the cat last year. At the home, wildlife officials cleared most media and gawkers away after darkness fell. Then they used several techniques that would not injure the animal to try to get him to leave. Trying to get the mountain lion to move on was handled by professionals. They fired a tennis ball cannon into the crawl space. The idea was that the noise and commotion would scare him out, a tactic that often works with coyotes. All the tactics, shown live on streaming video, drew mild reactions from P-22. None came close to drawing him out or even getting him to move much. I think that the mountain lion was famous because he survived with rat poison for a year but he still came out healthy and not sick.I also think that he is famous because he crossed two roads and he would not come out when they where throwing tennis balls,beanbags,and pocking him with prods. The mountain lion became a celebrity by living near the Hollywood sign in LA. The lion had its picture taken in front of the sign by a camera that was hidden. because slept under the house for a long time they thought it was a house cat a game warden went and got it from the under of the house. The Mountain lion became a celebrity because of the news media blow it up and people thought it was cool. So that's how it blow up because everyone watches the news so that's how. People saw it talk about it and it just blow up. I don't think that the mountain lion is a celebrity. I didn't know about P-22 until I read this article that my teacher assigned us. They took photos and videos and posted it online but as I said I had no idea about this P-22. I guess he could be a celebrity because he is online for the whole world to see. This story makes me wonder if there is a a cougar under my house right now. This animal probably got mad when it got messed with, plus maybe was looking for a better home or some place to bread off springs. The main idea of the story is that a mountain lion went under a house, and he would not budge when wild life officials were there. The officials were trying to get the mountain lion out without hurting him. When the officials were gone, the mountain lion left. I think that it must have been surprising for the family to learn about a mountain lion under their house. Officials from the National Park Service were trying to figure out where it was. It crossed two freeways to get from Santa Clause Mountains to Griffith Park. The mountain has been tagged and normally lives in Griffith Park. It wandered into the house of Jason's family and was under the house. Many people tried to get rid of the mountain lion by throwing tennis balls and other things at it. The family already had three cats too but was surprised to discover another one beneath their house. I think that the mountain lion became a celebrity when it went to where the people were. Not many people get to see mountain lions, especially if they are under a house. Many people went to see the mountain lion and get it out of the house.